The Centers for Medicare and Medicaid Services (CMS) issued a final policy for virtual groups under the Quality Payment Program for 2018. This will allow low-volume eligible clinicians to qualify for positive adjustments in Part B payments in 2020. For the performance year 2018, CMS offers a fourth option. Small physician practices with 10 or fewer providers and solo practitioners can virtually come together to be eligible for participation in MIPS. In 2018, the threshold for MIPS participation is at least 200 Medicare Part B patients or at least $90,000 in allowed Part B charges. It is noteworthy that this virtual banding together must occur before the performance period starts, i.e., before December 31, 2017. Moreover, the virtual group cannot be disbanded during the performance year. 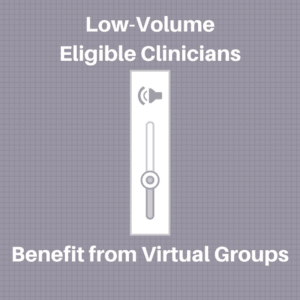 The CMS’s definition of a virtual group for MIPS participation is a combination of two or more tax identification numbers that have been assigned either to solo practitioners or to groups with 10 or fewer eligible clinicians or a combination of the two. The virtual group must report for a minimum period of 90 continuous days in 2018. Solo practitioners and small group practices can become part of no more than one virtual group for a given performance year. 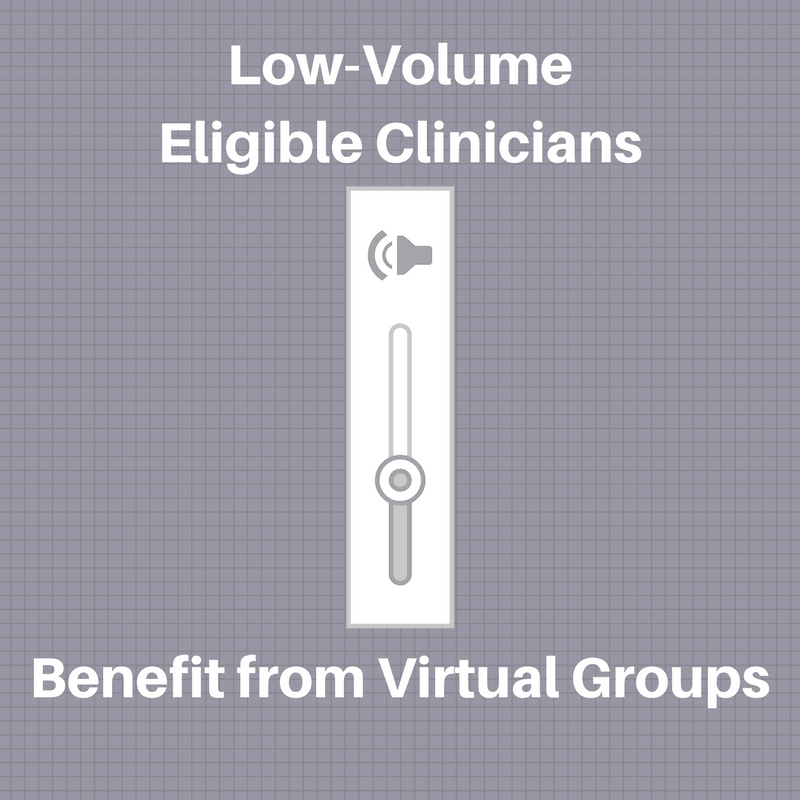 Each eligible clinician who chooses to be part of a virtual group will be assigned a unique identifier by the CMS. Lastly, establishing classification to compose the virtual group is prohibited. The combined performance of the virtual group will be taken into account to determine the MIPS payment adjustment in 2020 (for the performance year 2018). All eligible clinicians under one TIN will receive a positive or negative adjustment of up to 5 percent with a 3 percent scaling factor. Reimbursement of APM participants will be adjusted based on the APM score. To get full credit for CPIA (clinical practice improvement activities), virtual groups are required to report two high-weight and four medium-weight activities for a continuous 90 days. The only exceptions are small practices, HPSA providers, and non-patient-facing clinics. Stage 1: Solo practitioners and small group practices contact their QPP Service Center or technical assistance representative to confirm eligibility. Stage 2: The official representative of the virtual group submits the election of the group to the CMS before the December 31 deadline. The election of the group consists of a formal written agreement executed by each individual member of the group identified by a unique TIN. Each National Provider Identifier (NPI) included in the virtual group must be identified. However, it is not necessary for all NPIs who bill under one TIN to be part of the virtual group. Each NPI included in the group must be notified of their participation in the virtual group as this entails compliance with MIPS regulations and other applicable laws. Contact us to find out more information on how to become part of the virtual group.